Dragicevic, Vicka Ivankovic and Ivan Dragicevic, joined by Jakov Colo and Marija Pavlovic, went to the same place hoping to see Mary again. Since then, Virgin Mary talks and appears to all of the Medjugorje visionaries at least once a year (some of them have appartitions once a month or almost every day). Vicka was born on September 3, 1964 in Bijakovici near Medjugorje and is the oldest of the visionaries. Our Lady first appeared to Vicka on June 24, 1981 and since then, Virgin Mary appears to Vicka every day. She was confided with nine secrets so far. Vicka is now married, with two children – Sophia Maria and Anton. She lives with her husband Mario Mijatovic in Gradac, a small village located only few miles from Medjugorje. Vicka’s prayer mission given by Our Lady is to pray for the sick. The information Our Lady dictated to Vicka over these two years is contained in two hand written notebooks and will be published when Our Lady tells Vicka it is time to share them with everyone. Mirjana was born on March 18, 1965 in Sarajevo. She graduated from University of Sarajevo and is the most educated one of the visionaries. Although her family lived in Sarajevo in 1981, Mirjana spent summers with her grandmother who lived in Bijakovici. She was the first to be told the ten secrets now being entrusted gradually to the other visionaries. Her apparitions ceased on Christmas Day 1982, except for an annual visit from Our Lady on her birthday, 18th March. She will be the one who will reveal all the secrets to the priest of her choice, ten days before they are due to occur. Since August 2, 1987 Our Lady also started appearing to Mirjana on the 2nd day of each month to pray with Mirjana for all unbelievers. Mirjana tells us that Our Lady defines “unbelievers” as those who have not yet felt God’s love. These apparitions that occur on the 2nd of every month, were first very private and not even Mirjana’s family knew about then because she would have locked herself in the room and just started praying. But starting from February 2nd 1997, her apparitions would be public. Our Lady invites all to join them in prayer on this 2nd day of each month for unbelievers. For those fortunate enough to be in Medjugorje on the 2nd of the month, you can join Mirjana for this apparition, usually held in the Cenacolo community in Medjugorje. Mirjana is married to Marko Soldo and lives in the parish of Medjugorje. She has two children. 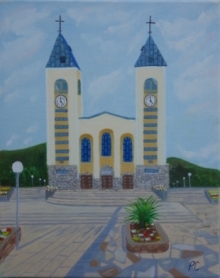 Marija was born on April 1, 1965 in Bijakovici, Medjugorje. She also has two sisters and three brothers. Her prayer mission is to pray for all the souls in purgatory. Marija Pavlovic-Lunetti is very spiritual and everyone who knows her says she is just beautiful, and her spirituality makes her very special. At the time of the first apparitions, Marija was studying in a nearby town, names Mostar, which is about 18 miles from Medjugorje. Our Lady of Peace first appeared to Marija on June 21, 1981, and still has daily apparitions. Marija was given nine secrets so far, and gives the public messages on 25th every month. Marija currently lives in Italy with her husband and four children. She visits Medjugorje few times a year. Ivanka is the youngest of the four girls who saw Our Lady of Peace and was the first one to see her on June 24, 1981. Ivanka was born on July 21, 1966 in Bijakovici. Her prayer mission is to pray for families. Ivanka’s mother died in 1981, and when Ivanka first saw Our Lady of Peace, she asked her about her mother. Virgin Mary replied that Ivanka’s mother is in heaven. Ivanka spoke with her mother about five times over two decades. Ivanka had daily apparitions from June 24, 1981 until May 7, 1985. Since then, Ivanka has apparitions every year on June 25, the anniversary of Medjugorje apparitions. She was confided with all ten secrets. Ivanka Ivankovic-Elez lives with her husband and four children in the parish of Medjugorje. Ivan Dragicevic was born on may 25th, 1965 in Bijakovici. His prayer mission is to prey for the youth and the priests. Ivan and Mirjana Dragicevic-Soldo are not related. Our Lady of Peace first appeared to Ivan on June 24, 1981 and he has daily apparitions. He was confided with nine secrets. Ivan is married, and with his wife and three children lives both in Boston, MA and Medjugorje. Jakov Colo is the youngest of all visionaries. He was born on March 6, 1971 and was only ten years old when he first saw Blessed Mary. His prayer mission is to pray for the sick. Jakov’s mother died in 1983, which deeply affected Jakov. His father worked in Germany, as well as other men who were unable to find jobs in Medjugorje in 1980s. Jakov had daily apparitions from June 25, 1981 until September 12, 1998. On that day, Blessed Mary gave him the 10th secret and told him that apparitions will continue once a year, on Christmas day. Jakov had a hard time accepting that, because his mom died when he was very young, and he hardly saw his father. Jakov is now married with three children and lives in the parish of Medjugorje.